IrrigationBox supplies technically advanced hydrolic and plastic irrigation filter systems for variety of irrigation solutions. Irrigation water can contain a variety of contaminants from silt and sand to algae and other decaying organic matter. Not all contaminants can be removed but with the correct filter the water can usually be cleaned enough for effective irrigation. 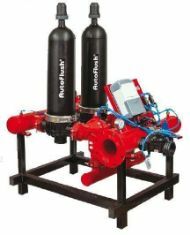 The level of filtration required is dependant on the type of irrigation system. Drip irrigation will need much finer filtration than spray irrigation to prevent blockages. Most filters are available as manual or automatic. Manual filters require regular inspection and cleaning to keep them clean. Some manual filters are fitted with a brush or scanner assembly which allows them to be cleaned without disassembling. While this is a time saver it still requires regular checking. Automatic filters are fitted with a timer and/or a pressure differential (PD) switch. 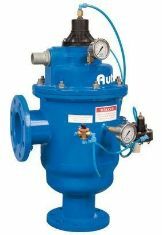 When the pressure differential across the screen reaches a pre-set value the filter goes into a backflush cycle and cleans itself. This type of filter is essential for automatic irrigation systems. Screen filters work well with inorganic matter such as silt and sand. They generally consist of a very fine stainless steel mesh that traps particles. Screen filters are generally cheaper to purchase than disc or media filters. Disc filters are excellent on most types of contaminants. They consist of a numbers of grooved discs stacked on top of each other. This gives a three dimensional filtering effect which works very effectively on both sand and organic matter such as decaying weeds and algae. Filters are available in a number of configurations and can be modular for easy expansion as irrigation systems are expanded. 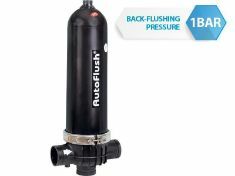 Disc filters generally require a higher water pressure to backflush effectively, however recent advances in design have seen low pressure disc filters introduced. Gravel filters are suitable for both inorganic and organic contaminants. They are tanks filled with sand or gravel media. Water passes through the bed of media and particles are trapped. Media filters offer a much bigger surface area and as such can usually provide more effective filtration. Cleaning is achieved by reversing the flow of water through the tank to lift and separate the sand. Trapped contaminants are purged to waste as the water flows through. 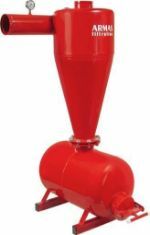 Hydrocyclones use centrifugal force to "spin" sand out of water. Often water from bores contains high levels of sand. The hydroyclone creates a spinning action causing the heavier sand particles to separate from the water and become trapped in a storage tank at the base of the unit. Hydrocyclones are generally used in conjunction with another type of filter. These filters can handle flow rates from 10-20,000 gpm with screens as small as 10µ. The MTF filters use very little water for rinsing so the main flow is not interrupted. Automatic hydraulic self-cleaning screenfilters are applied in cooling towers, heat exchange protection, ion exchange protection, industrial waterwater recycling, effluent polishing, water supply, filtration for micro irrigation. The automatic hydraulic selfcleaning screenfilters normally put in the place of the sandfilter. Automatic Self Cleaning Filters assure continuous flow, simplified maintenance and worry-free operation. 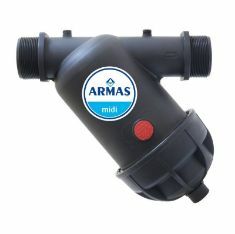 They are suitable for all types of industrial and irrigation applications. If you need help to choose the most suitable filtration system for your water system, please contact us.